American companies looking for a way out of punishing steel tariffs say they're trapped in a bureaucratic nightmare. As they seek exemptions from the tariffs, which have sharply raised costs, these companies describe a lengthy, opaque review process. They say the uncertainty is already hurting their businesses and may cost them jobs. Companies had filed more than 20,000 exemption requests through last week, arguing that they depend on imported steel and that domestic producers can't fill the gap. The Commerce Department had announced a final ruling on only 98 of them. "One of the frustrations is just not knowing," said Rick Huether, whose family has run Independent Can Company, a Maryland can maker, since 1948. Complicating the process, large steel companies like US Steel (X) and Nucor (NUE) have tried to block many requests at the last minute, giving businesses that want exemptions little or no time to respond. "There's no particular opportunity to go back and say they're wrong," said Alexander Schaefer, a partner at the Washington law firm Crowell & Moring representing roughly a dozen companies that have filed exclusion requests. Because of the delay, workers whose jobs could be at risk are stuck in limbo. 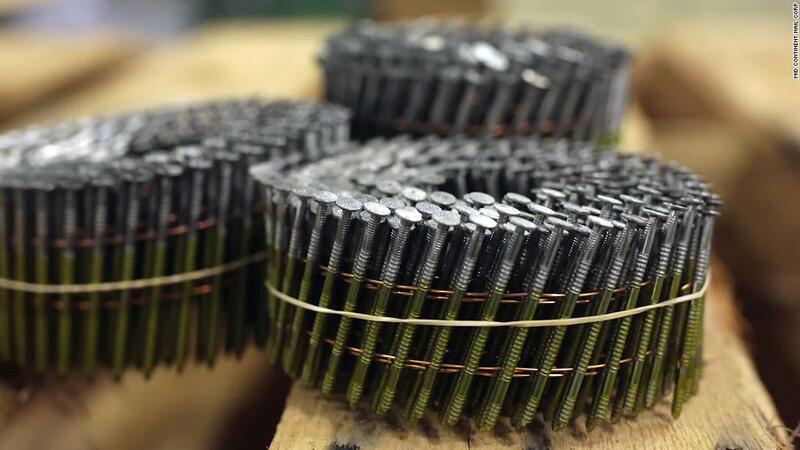 The nation's largest nail manufacturer, Mid-Continent Nail, laid off 60 of its 500 workers last week because of increased steel costs. The company is in danger of shutting production by Labor Day unless the Commerce Department grants it a tariff exclusion, company spokesperson James Glassman told CNN's Poppy Harlow on Tuesday. President Donald Trump frames his trade philosophy as "America first." Trade policy itself is not always so clear-cut. A tariff that helps one company can hurt another, including in the United States. Trump's effort to protect the American steel industry is hurting many companies that rely on steel and aluminum, often imported at lower cost. An activist trade policy means picking winners and losers, even if indirectly. Some of those losers are American companies. "I like Trump's ideas. I don't like his tactics," Huether said. Saving one job in manufacturing could cost many more at other companies, he added. The Commerce Department granted its first exclusions for steel tariffs last week. Seven companies, including razor maker Schick Manufacturing, were told they didn't need to pay the tariffs when importing certain components. Trump imposed the tariffs on steel and aluminum imports using a little-known national security provision in a 1962 trade law. Because that provision is rarely used, both the Commerce Department and companies have to navigate an unusual exclusion process. Commerce Secretary Wilbur Ross said in a press release that the exclusions issued prove his agency is "taking a balanced approach" to the tariffs, and will continue to protect both downstream industries and national security. Still, the agency has yet to make final determinations on thousands of requests. Last week's decisions covered fewer than 100 requests — 56 denials and 42 approvals. Companies generally need to make numerous submissions, because the forms themselves are specific. For example, if a company buys three sizes of steel coil from a producer in South Korea, it must file three separate exclusion requests. Ross acknowledged "the magnitude of the chore" at a hearing before the Senate Finance Committee last week, and said the agency is getting faster. He noted that the Commerce Department has been granted $1 million to hire more employees to help. A Commerce Department statement said Congress is considering a request for more funding. The agency has said it will typically grant exclusions if companies can't get steel domestically and there aren't "overriding" national security concerns. But the process is not straightforward, and the Commerce Department has not provided further insight on what it looks for as it evaluates requests. The denials issued to 11 companies last week provide scant information about why the requests weren't approved, according to a review of the denial letters, which have been posted online by the Commerce Department. Some companies whose requests were rejected faced objections from US steel producers, which claimed they could meet demand. Seneca Foods, which has filed at least three exclusion requests, said in one petition in April that it needed steel from China to make fruit and vegetable cans, because domestic supply is insufficient and of lower quality. US Steel (X) filed a rebuttal, arguing it could supply the steel in question. The objection was posted online by the government one day after the 30-day comment period for Seneca's request ended. At that point, it was too late for the company to respond. The Commerce Department subsequently denied Seneca's exclusion request. The rejection letter said the application was incomplete, but the Commerce Department didn't specify what was wrong. "The requester has not sufficiently addressed the reporting requirements specified in the form," the denial letter said. Seneca Foods did not respond to requests for comment. A spokesperson for US Steel said the company is "opposing product exclusion requests for products we produce." Companies can't appeal after they are denied exclusions, but they can file new requests. But that opens the door to fresh problems. New requests restart the clock, and companies that are granted exclusions are only reimbursed for the tariffs they have to pay during the review process. They don't make back money they lost during any previous review periods, according to Crowell & Moring's Schaefer. Schick was granted exclusion requests for steel razor blades from Japan and Sweden. The Commerce Department found that the products were "not produced in the United States in a sufficient and reasonably available amount or of a satisfactory quality," according to a letter explaining the decision. The agency also found "no overriding national security concerns." No objections from steel companies are listed online for the exemption requests Schick had approved. The company still has some exclusion requests pending. Nucor, which has filed objections in other cases, said it only objects if Nucor makes the product in question or a substitute, or if it will soon have the capability to make such a product, according to a spokesperson. For Independent Can Company of Belcamp, Maryland, the backlog and the murky process have ramifications. The company, whose customers include 1-800-Flowers, Garrett Popcorn and Ghirardelli Chocolate, can't afford to pay higher prices for the steel it imports from Germany. It also says it can't get the steel it needs from domestic producers. Anticipating problems with supply, customers began to bail as early as February. Huether, the CEO, said Independent Can is hoping for a lifeline from the Trump administration. The company has submitted about 40 petitions to protect its 400 employees in Maryland, Ohio and Iowa, he said. But it hasn't heard anything yet. "The uncertainty is killing us," Huether said. Although Independent Can would theoretically like to buy more metal from US Steel, which is already a supplier, US Steel doesn't make steel coils that are big enough to meet its needs, and the quality is not up to par, Huether said. US Steel countered these allegations with objections to at least four of Independent Can Company's requests. Domestic industry can meet Independent Can Company's demands, US Steel wrote in its letters to Commerce. The objections from US Steel were filed just before the comment periods closed, and weren't posted online by the government until days later. For example, one US Steel objection was received on May 29. The comment period closed on May 30. The objection was posted online by the government on June 5. Independent Can Company had no time to respond, Huether said. ArcelorMittal, a Luxembourg steel company with US facilities, also filed objections to Independent Can Company's exclusion requests. Those came in two days before the comment period ended, or the day of. They weren't posted until several days later. ArcelorMittal did not respond to requests for comment. Independent Can Company stocked up on steel from Germany earlier this year. But it will run out of imported steel for some items in August, and will use up its supply entirely between September and October. At that point, it will be in trouble, Huether said. "There are lots of plants in China that would love to sell us finished cans," Huether said. "We would become a distributor instead of a manufacturer, which we could probably do with 20 people instead of 400."